NEVILLE BUCHANAN – Harryhausen’esque, Tippett’ish, Thunderbirds’like? A somewhat hidden & unsung talent quietly residing in the UK? His name Neville Buchanan. He has been around the animation biz for years. Not even I, really knew about Neville, however some years ago I do recall seeing his Youtube channel and I may have mentioned him & his channel here at SMW News, way back. It seems as though, he remained mostly in the background not publicizing himself as much. More recently though, Neville has become more active in the social media sphere and all I can say is WOW regarding his work, particularly his unique aesthetic style & vision. As I said, Neville has been around. Very eclectic multi-skilled capable, not only as a Stop Motion Animator but also accomplished in the technical & craft aspects with the hands-on creation of puppets, miniatures, practical special effects, and possessing CGI digital skills. You want more? He also can ‘wear different hats’ if one needs a crew supervisor, producer, director. When I saw Neville’s work in the past and more recently, the immediate impression I got was influences of or shades of Ray Harryhausen (Dynamation), Phil Tippett (wild & surreal creature character designs) and flavors of the ol’ Classic Thunderbirds, however, Neville’s is more dramatic & dark and also using more visuals than dialog. He definitely does has his own style, vision, signature & flavor. I am just making attempts to describe his works. Maybe you have better adjectives than me. 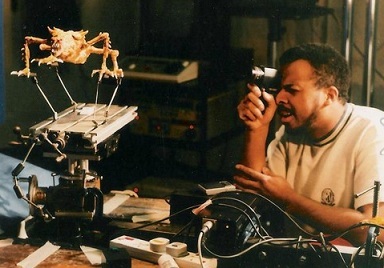 Take a look at this demo … a blend of digital sets/backgrounds, stop motion animated characters, and real models/miniatures … Neville’s crew included Steven Archer (Clash of the Titans), Spencer Cooke, and Phil Dale …. At Neville’s personal Facebook page (‘FNS spfx’), many photos & other teasers of behind the scenes including walls covered with shelves and stacked with plethoric quantities of puppets and model miniatures ready at hand to fulfill his own project demands. Unfortunately for you Anti-Facebooker’s (I completely understand!) if you are not part of that social-schmocial stuff, you are missing out here, this time. This other clip below, to me, has a trippy sort of meditative & dreamy feel to it … a music video flavor …. If some forward thinking-out-of-the-box ‘Suit’ were to hire me as, maybe an ‘associate producer’ for a Harryhausen-esque project , I would bring together a POWERHOUSE TEAM of Lead Stop Motion Animators who are what I call the ‘Children of The Harryhausen ™’! On that elite team as follows: Peter Montgomery, Ron Cole, Brett Piper and Neville Buchanan! Of course there would be additional crew in supportive positions…. other animators, modelmakers, puppet fabricators, technical, etc. Of course this is niche entertainment product. One of the alternative distribution venues for Indie work is what is known as Webisodes which also requires a production budget. Neville and other talented artists/filmmakers can certainly do it very cost effectively. The problem is, not enough visionary Indie Producers to go for this kind of entertainment product, or, we need to reach out and let them know. I do not know what is the answer is. I know everyone says ‘Crowd Funding’, but that is hit and miss chance with much uncertainty and not a consistent source for a budget. A crowd funding campaign is a one-shot gamble for a specific project. Spread the word & SHARE …. Neville Buchanan needs to be recognized! Peter…perhaps somebody soon can organize this very thing. That would be a great idea Peter. Familiar with Nev’s work. It would be good to see the work of stop-motion professionals at the Tate–regarded with the respect & valuation accorded Lucian Freud’s paintings. That would certainly give credence to the popularity & reverence for this artform. Also, Mr. Saatchi himself could scroll through his contacts for any number of deep-pocketed art investors to fund films, festivals or museum devoted to same. It can be done. Just a thought. Bunch a Care-Acters…thaa all I gotta say. I am not necessarily criticizing those well known players in mainstream movie making business. Just that, instead of just talk, ‘they’ could lend their position of clout or stamp of approval to independent works. In the opening credits, example, “Guillermo del Toro presents a (enter Indie filmmaker name here) Film“. Just their name association to indie project would maybe encourage investors/backers and also they would be promoting fresh, original, different, unique entertainment content via indie market. Thank you jriggity and Anonymous for your comments. Where are the George Lucas types, the Steven Spielberg types, the Guillermo Del Toro, types etc? We could really do with one of these “BIG BOYS” paying attention to this situation and placing some jobs into our hands. Ron, Peter, Richard Kent Burton and Justin Rasch have done wonders with the work they have done in our game and Nick also. Perhaps if we can buck this CG only trend with a gradual feed into the mainstreams consciousness of some regular effective STOP MOTION we will get the notice that will put our stuff back into focus and perhaps re-vogue serious STOP MOTION. Cooperation and co-ordination with a long term plan of attack. It will take several factors but its not impossible. I’ve seen some of Neville’s work way back…( when it was put onto vhs tape! )… great to watch this more up to date reel, and see that there are some projects on the go. Of course, Neville can clearly do all of it himself, but for a demanding project like a series or feature, what a powerhouse team that would be! I talk to Nev on the phone frequently, and he is indeed a nice guy. If God willing the can get funding for all this. I too have been requested to assist with compositing and stop motion. I’ll be taking on the comp work over the actual animation. Hope it all pans out Nev old buddy. Well done Neville!! what a huge body of work you have created!! ^ That seems like an awesome plan. Ron Cole is a beast animator, PM is a go-to for VFX and composition, Saul Vortex is a visionary, and Mr. Buchanan does a great job of “blending” and using all effects methods for his stories. I think it can be a great show. Yes I have something developing that I want to launch more sooner than later and its NEW. I have spoken to Ron and four others and I am currently putting the finshing touches on a preposal. My thinking is to launch a STOP MOTION series on TV with the kind of mix of eg: THUNDERBIRDS and 24 with some creatures neatly placed within. The second phase may then come a bit easier… the launch of some STOP MOTION movies that are based around this premise and have a considerably bigger budget. I am on a mission to round up the best STOP MOTION talent thats available and to produce something that hasnt been done before in my style with this tried, tested and loved technique. I dont want to see STOP MOTION vanish or go ONLY in the direction of TIM BURTONS style even though I do like his stuff. I see the Aardman style all over the place but thats not what Im about. I would like to try and place a “NEW MENUE” on the STOP MOTION table in a regular way. I am glad of the support so far from some great people that include Lio and Ron to name just a few. Lots more to say but at a later stage. Ha! LIO, Neville and I have already been in contact… plans are afoot!